Col. Dinoh A. Dolina, Commander of the Army’s 802nd Infantry Brigade (4th from L) stood next to Mayor Ramon Oñate, P/Chief Insp. Hipolito Delima, LtCol. Nedy Espulgar of the 19IB and the members of the Sangguniang Bayan during the signing of the Joint Declaration of Palompon, Leyte as Insurgency-Free Municipality on February 16, 2015. KANANGA, Leyte – The military has declared the entire municipality of Palompon, Leyte as insurgency free. 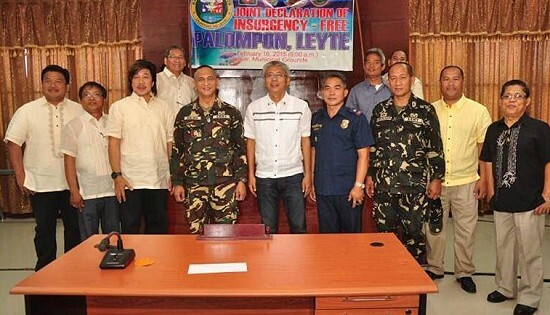 The 19th Infantry Battalion of the Philippine Army and the local government of Palompon, Leyte issued the declaration following a series of validation and assessment in the area, turning over the peace and security responsibilities over the municipal government and the municipal police. According to Col. Nedy Espulgar, Battalion commander of 19th IB, Palompon has been enjoying a peaceful existence but noted the need to further step up security in the municipality, which has become among one of the region’s top tourism destinations. Espulgar said that while Palompon has been relatively peaceful, the root cause of the insurgency must be addressed by the government, to ensure the LGU keeps its status. “The government should work closely with the Municipal and provincial planning and development office and other line agencies for programs that would help the locality remain insurgency free”. Col. Dinoh Dolina, Brigade Commander of the 802nd brigade Philippine Army, said that peace and security is a complex issue that involves the implementation of firm policies and it requires help from all stakeholders in the community. Intelligence assessment revealed that Palompon had long been insurgency free when two of its infiltrated barangays were cleared in 2003. Palompon is now the third town in the province of Leyte to be tagged insurgency free next to Merida and Matag-ob, Leyte last year. ORMOC CITY, Leyte – Army troops under 802nd Brigade partnered with the World Outreach Foundation Kansas City, the Local Government Unit of Ormoc City, the Rotary Club of Ormoc Bay, and the Ormoc City Medical Society in providing medical and dental services at Ormoc City District Hospital Last February 8-12, 2015. 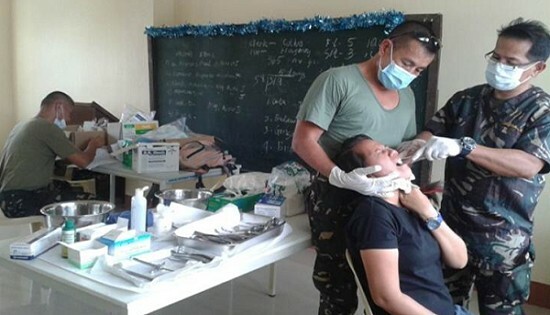 Some 873 residents coming from the far flung barangays of Ormoc City and nearby municipalities benefited from the four-day medical and dental services. Some of the medical procedures conducted were: excision of neck masses, and cysts; medical and dental consultations; and tooth extractions. Col. Dinoh A Dolina, 802nd Brigade Commander, lauded the said event and also commended the contribution of the respective partner stakeholders in the conduct of the activity. Dolina said that more concerted efforts will be pushed through by his brigade in their effort to assist the LGUs in Leyte provinces in serving their constituents. “Working with stakeholders is the concept we are following in serving the Leyteños. With this concept, the people of Leyte Provinces can expect more joint service-oriented activities will be conducted by my brigade in partnership with stakeholders,” Dolina stressed. MANILA – A coalition composed of religious, human rights advocates, lawyers, progressive organizations and Moslem professionals have bonded together to form PEACE Camp or Campaign for Peace with Social Justice amidst the on-going probes on the Mamasapano tragedy in Congress. 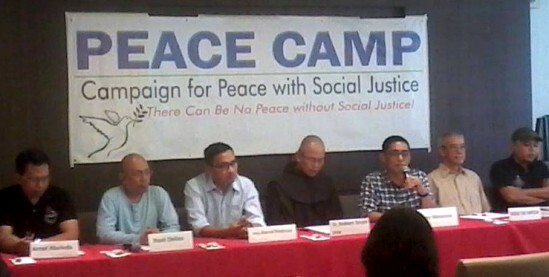 At their press conference which also served as their public launching, PEACE Camp lead convenors announced their “unwavering commitment to push for All-out peace with social justice in Mindanao, to stop the US-led “war on terror” in the Philippines, and campaign for the Right to Self-Determination of the Bangsamoro Nation”. They called the US involvement in the operations to get Marwan a “white elephant” in both the Senate and House hearings. They also claimed that, “consciously being omitted in the raging fervour for justice is the culpability of the US Government who engineered Oplan Exodus and not a few failed operations before it”. PEACE Camp claimed that the Mamasapano tragedy is “a testament to the reality that far from acting as a sovereign State, the Philippines under the auspices of President Benigno Aquino III continues to willfully and willingly enforce the wishes of the United States Government”. The group blamed Aquino for allowing “our sovereignty to play second fiddle to that of the US, when it acquiesced to Oplan Exodus at the expense of scuttling the unfolding peace process and risking the lives not only of the Fallen 44 but scores of civilians”. “We demand for the immediate rejection of the continued US military presence in Mindanao and elsewhere in the country in utter disregard of our sovereignty as a nation, their statement said. “We underscore the need for a lasting peace in Mindanao based on justice. We call for justice for the centuries-old oppression and exclusion of the Bangsamoro from meaningful participation and self-determination of their destiny. Peace cannot reign in situations of injustice. Justice restores the dignity of the Bangsamoro as a free, equal and peace-loving people of Philippine society”. “We demand for the immediate rejection of the continued US military presence in Mindanao and elsewhere in the country in utter disregard of our sovereignty as a nation. We demand that the Philippine government side with the Filipino people by rejecting the US-led War on Terror”. PEACE Camp Convenors include: Fr. Robert P. Reyes of Gomburza, Atty. Aaron Pedrosa of Sanlakas, Atty. Arpee Santiago of the Ateneo Human Rights Center, Misty Amistad of the Task Force Detainees of the Philippines (TFDP), Atty. Banjo Lucman of the Muslim Lawyers Foundation (MUSLAF), Mike Gary of Bukluran ng Manggagawang Pilipino, the Friends of the Bangsamoro Network, Atty. Tecson Lim, Atty. Abdel Jamal Disangcopan and Miss Manila 2014 Ms. KC Halili. 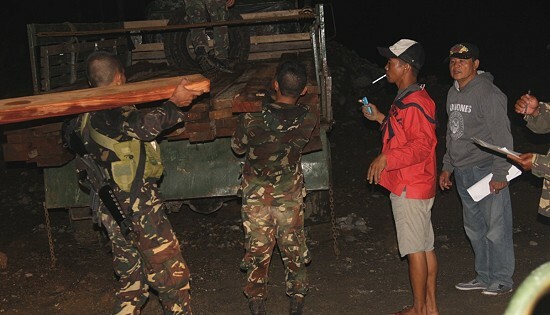 CAMP LUKBAN, CATBALOGAN CITY – Army troops under the Burauen based 78th Infantry Battalion, Burauen PNP, and Burauen MENRO confiscated 10,000 board feet of illegally cut lawaan lumbers at Brgy Tagadtaran, Burauen, Leyte last February 9, 2015. In a report from Lt. Col. Allan Jose Taguba, Commanding Officer of the 78th Infantry Battalion, Ms Delia Inferno of MENRO Burauen and personnel of Burauen PNP made coordination with 78th IB to assist them in confiscating illegally cut lumbers. Taguba immediately formed a team and augmented the PNP and MENRO in the confiscation of the illegally cut lawaan lumbers. In addition, he also provided vehicles that hauled the lumbers to the station of Burauen MENRO. It can be recalled that the Anti-Illegal Logging Task Force created under Executive Order 23 which is chaired by the Environment Secretary, with the Interior Secretary, Defense Secretary, the Armed Forces Chief, and the Philippine National Police Chief as members approved a resolution deputizing all officials and personnel of the Armed Forces of the Philippines as environment and natural resources officers. Maj. Gen. Jet B. Velarmino, 8ID Commander, lauded 78IB for exercising its mandate as protector of environment and natural resources by assisting the DENR in enforcing environmental laws. Further, he reiterated the 8ID under his command will continue support to the DENR in implementing its environmental protection program. CAMP VICENTE LUKBAN, Catbalogan City – Troops under the Calbiga, Samar based 87th Infantry Battalion encountered NPA members at Barangay Bunga, Motiong, Samar at around 1:00 o’clock in the afternoon of February 10, 2015. According to the report reaching the 8th Infantry Division Headquarters from Lt. Col. Antonio B. Dulnuan, Commanding Officer of the 87IB, a nine-man squad of his unit was conducting combat patrol in a recently seized NPA camp at Barangay Bungawhen they observed eight suspicious individuals loitering around. When the troops asked the suspicious people to identify themselves, they were fired upon, prompting the troops to return fire. The encounter lasted for five minutes until the NPAs withdrew. Dulnuan reported that there were no casualties on both sides, but his troops recovered two shotguns, one cell phone, one hammock, four pairs of boots, four pairs of slippers, and empty shells of shotgun, AK 47 and M16 rifles. Pursuit operation is ongoing as of press time. Lt. Col. Antonio B. Dulnuan lauded the efforts of his troops and the support of communities to their peace initiatives. He vowed to continue to go after the NPAs who want to recover areas won by the local people and the Army from their influence. “The operation at Barangay Bungawas is a fruit of the partnership between the 87IB and the local populace in safeguarding their community. The locals do not want NPAs to set foothold in their barangay and lost again their freedom from fear, extortion and intimidation which NPAs bring about in areas where they are present. It should be noted that the Province of Samar, which the town of Motiong belongs, was declared as Peaceful and Ready for Further Development last December 2014 and we intend to keep it in that state,” Dulnuan said. CEBU CITY – The Cebu Provincial Government and officials and representatives of the Department of Education (DepED) and 10 Local Government Units (LGUs) last February 6 entered into separate agreements with the Ramon Aboitiz Foundation Inc. (RAFI) on the construction of multi-story school buildings in 10 areas identified as experiencing acute shortage of classrooms. Aside from the mayors and/or their representatives, the agreement signing, which was part of RAFI’s High School Building Program, was held at the Capitol Social Hall and was graced no less by Governor Hilario Davide III, Vice Governor Agnes Magpale, DepED Regional Director Juliet Jeruta, and DepED-Cebu Province Schools Division Superintendent Arden Monisit. School heads of Calape National High School (NHS), San Remigio NHS, Marikaban Integrated School (IS), Bagalnga IS, Carmen NHS, Catmon IS, Mohon NHS, Sangat NHS, Mantalongon NHS, among others, were also present during the signing. Anthony Dignadice, RAFI Education Development Unit executive director, said the agreement signing was a result of RAFI’s effort to collaborate with concerned sectors in its endeavour to help address the problem of lack of classrooms in Cebu. "One of our strategies in RAFI is collaboration. In the Education Development Unit of RAFI, we have been partners with LGUs and other stakeholders. Since last year, we established a partnership with the (Cebu) Provincial Capitol in terms of delivering our education programs,” he said. “This year, once again, we are specifically engaging the Province as our key partner to support our education priorities in the construction of 10 multi-storey school buildings in various areas where there are critical classroom gaps," he added. Last January 26, the Cebu Provincial Board authorized Davide to represent the Capitol in signing the agreements, as construction of each school building entails that the Province shells out counterpart funding. For example, a three-story, nine-classroom school building at San Remigio NHS (San Remigio town) requires that the Capitol sets aside P4.31 million as counterpart amount to RAFI’s P8 million. This type of school building will also be constructed at Catmon IS (Catmon town) and at Carmen NHS (Carmen town). A two-storey, six-classroom building costing P8 million (Capitol, P3.07 million; RAFI, P5.7 million) will also be built at Sangat NHS (San Fernando town), Bagalnga IS (Compostela town), Calape NHS (Daanbantayan town), Mantalongon NHS (Barili town), Mohon NHS (Sogod town), and Marikaban IS (Santa Fe town, Bantayan Island). Madridejos NHS (Madridejos town), on the other hand, will have a four-storey, 12-classroom building worth P16 million (Capitol, P7.5 million; RAFI, P8.5 million). For all agreements, the LGUS are required to “provide institutional, technical and operational support in the implementation, monitoring and evaluation of the project” and facilitate compliance with the required permits. DepED, on the other hand, is expected to “provide institutional support and ensure smooth implementation of the project,” “be responsible for the custody and maintenance of the completed school building,” and provide the needed teachers and school fixtures, among other obligations stipulated in the agreement. "We look forward to continue this partnership with the Province for the construction of more school buildings for high schools, including Tech-Voc facilities to help prepare for the implementation of the senior high school program beginning school year 2016-2017 under the new K to 12 curriculum of DepED," Dignadice said following the signing of the agreements. BORONGAN CITY, Eastern Samar – In Eastern Samar, tricycle drivers and fisherfolks stand to benefit from a P200,000 financial support from Senator Alan Peter Cayetano. Personally turned over by Cayetano on January 31, 2015, the funds will be used as seed fund for Eastern Samar State University (ESSU) Riders Tricycle Operators and Drivers Association in Borongan, and Barangay 6 Fisherfolk Association in Guiuan town; two towns recovering from damage brought by recent typhoons. Borongan sustained damages to property, livelihood and lives in December 2014 due to typhoon Ruby (international codename: Hagupit) while Guiuan still continues to recover from all that was lost to super typhoon Yolanda (International codename: Haiyan). Meeting with fisherfolks in Guiuan and tricycle drivers and operators in Borongan, Cayetano also gave gifts to daycare children. “Since super typhoon Yolanda hit Eastern Samar, I recognized the need for small business owners to adopt a system where they would have access to capital that doesn’t require interest payments of up to 20%. The PTK program would be an example of a successful financial aid structure that works,” Cayetano said. Cayetano's Presyo Trabaho, Kita/Kaayusan (PTK) Kontra 5-6 program will allow members of the two organizations to give out small loans to members at low interest rates and easy payment schemes eventually encouraging them to start their own small businesses. Aleli Macawile, a member of the ESSU Riders TODA said he has trouble saving up for his tricycle's monthly amortization that he often turns to loan sharks that collect almost P200 in interest for every P1,000 loaned. "My co-members tell me that through this PTK, I only have to pay P30 for every P1,000 I borrow. This will make a lot of difference," Macawile said. According to Cayetano he plans to cover more sectors with the program. "We aim to not only provide support to a particular sector but the whole community. From vendors, to fishermen, farms and transport workers, the PTK aims to give micro-entrepreneurs a chance to be successful by providing them a sustainable capital buildup,” he said. “I want to show the government that this works. If we can give P64 Billion on Conditional Cash Transfers, why can’t we give local government units P1 Billion per region for micro-financing programs like the PTK? Small Businesses are among the top job generators in the country and the government should encourage their growth,” Cayetano added. CAMP VICENTE LUKBAN, Catbalogan City – Army troops operating in Northern Samar Province encountered New People’s Army members in a remote area of Barangay Imelda, Las Navas, Northern Samar early morning of February 3, 2015. Based on the initial report from Lt. Col. Edgar R. Delos Reyes, Commanding Officer of the 34th Infantry Battalion, his troops were conducting Peace and Security Operations when a concerned citizen informed them about the presence of NPA rebels at Barangay Imelda. The troops immediately responded and proceeded to where the NPAs were last seen. Upon arriving at the vicinity of Barangay Imelda, the troops were fired upon triggering a 15 minute firefight until the NPAs withdrew. The encounter resulted to the capture of two (2) unidentified NPA rebels who were left behind by their comrades. The two NPAs are still in the custody of the operating troops and will be handed over to PNP custody once extricated from the encounter site. On the part of government troops, one soldier was critically wounded at the left chest and was immediately evacuated through a military helicopter. Unfortunately, he died on way to the hospital. The identity of the slain soldier is being withheld pending the notification of his family. Maj. Gen. Jet B. Velarmino, 8ID Commander expressed his condolence to the bereaved family of the slain soldier and also expressed his appreciation to the efforts of other troops involved in the operation. CALBAYOG CITY – To raise the standard of public service, nurture and nourish the culture of professionalism, integrity and competence, DPWH-Region VIII through the Regional Data Management Office headed by Ms. Antonieta R. Lim, Public Information Office II conducted the Echo Conference for PIO designates on Communication and Advocacy Planning Workshop. Resource speakers came from the Stakeholder Relations Service – Mr. Randy del Rosario, Information Officer IV and Mr. Andro V. Santiago, Community Affairs Officer IV together with Mr. Jerry Esplanada of Philippine Daily Inquirer. The Regional Office saw an urgent need to renew and revitalize the information and public relations arms, in the regional and district level, modernize its information and communication systems and equipment and more importantly update and hone the knowledge and skills of the PIOs on the latest information and communication methods, techniques and trends. Communication Management as discussed by Mr. Randy del Rosario, OIC-Chief Public Information Division presented the evolvement of PIOs role from simply transmitting information in an objective and neutral fashion to its intended audience to helping define objectives and philosophies while helping the organization adapt to the demands of its constituents and environment. Another additional role PIOs have to undertake is manning the Citizens’ Feedback Management Center (CFMC) through the establishment of Public Assistance/Complaints Desk pursuant to RA 9485 (Anti-Red Tape Act of 2007) which was extensively shown to the group for information and reports for reference. 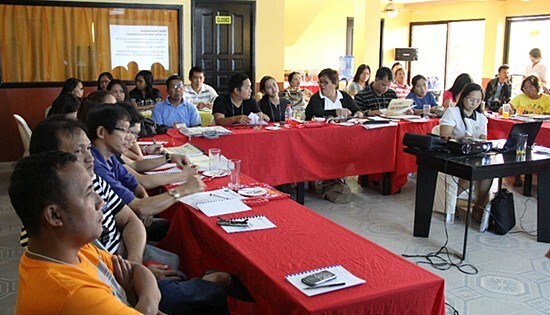 The PDI correspondent, Mr. Jerry Esplanada offered exercises and workshop on newswriting and writing tips. The 2-day advocacy planning workshop enhanced the communication skills and knowledge of the Public Information Officers in carrying out their tasks of communicating the department’s programs, projects and achievements to the public.